Save time with our prefinished mouldings, no more sanding, staining or finishing. You can install them right out of the box. Thanks to Finium's application process we are able to offer the very best results in industrial finishes. Add pleasing corner curves to the edges of your staircase and get rid of harsh angles. Alexandria Moulding Oak Bull Nose Cap 5/8 In. x 1-1/16 In. x 10-1/2 In. Bullnose caps are used to finish off exposed side edges of stair treads. Adds a pleasing rounded edge to the overall look. This stair nose moulding provides a finished look by completing the change from wood flooring to a top stair step. The durable finish coordinates with our Heritage Mill Natural Red Oak Hardwood Flooring. Molding is made of solid wood with coordinating stain (no pattern). 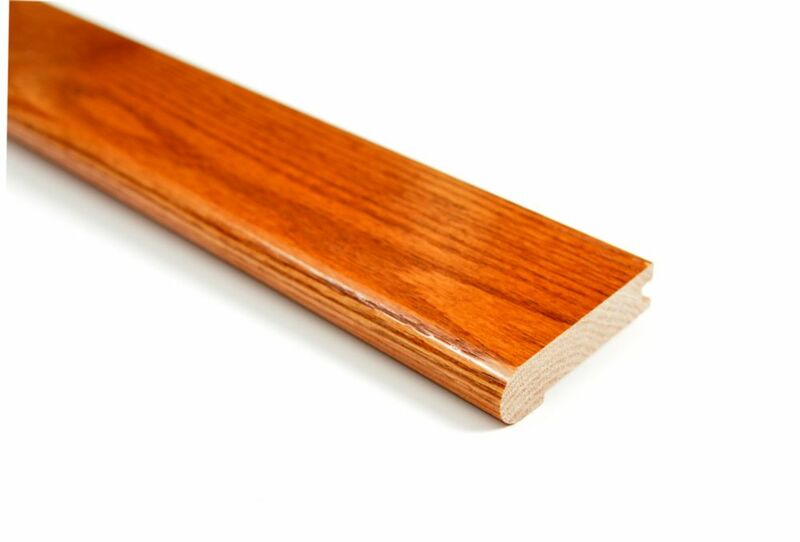 This moulding is proudly crafted in the U.S.A. from wood grown and responsibly harvested in the U.S.A.
45-inch x 3/4-inch x 3 1/8-inch Oak Nosing in Gunstock Save time with our prefinished mouldings, no more sanding, staining or finishing. You can install them right out of the box. Thanks to Finium's application process we are able to offer the very best results in industrial finishes.